We start this extraordinary evening in a classical concert hall. Festival coverage aside, we usually report from dimly-lit, smoky, more or less crowded venues, but tonight we enter the splendour of Hamburg's venerable Laeiszhalle. A place that smells of polished wood and expensive perfumes, a place where carefully dressed people find their numbered seats well before the show begins. Actually, most of the roundabout 700 visitors are here for Heather Nova, an Indie Rock/ Pop singer/ songwriter who has worked up quite a following over the last 25 years. With all due respect to her musical output, our momentary interest is sparked by her younger brother Mishka who is opening the show throughout her tour. 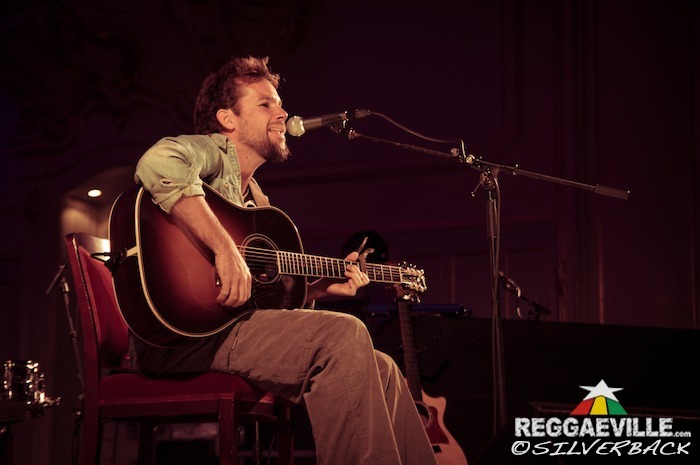 After a short interview with the Reggae artist (during which he tells us that he'll be back in spring for a full tour! ), we enter the Big Hall where everything is already prepared for the concert. The impressive organ at the back of the stage is illuminated with dreamily changing lights, and Mishka, arranging himself comfortably on a chair and adjusting his guitar, looks around and says "I like it here!". During the next 30 minutes, the likeable young man with a voice full of ocean, sunshine and emotion takes us on a trip to some of his melodious acoustic pieces. He accompanies himself not only skillfully on guitar, but also with the stomping of his bare feet. Half of the songs are taken from his recently released album Roots Fidelity; More Greens, for instance, a track promoting a healthy lifestyle. The moment Mishka dives into the up-tempo Rocksteady, I regret the seating arrangements - this tune simply calls for dancing! But while I can hardly keep still in my seat, the other spectators barely so much as nod to the beat. When the singer inquires "Hamburg, how you feeling? ", the few people who do answer say "Good!" instead of the usual "Irie! ", and again I marvel at the difference in setting – I really enjoy this, but I do miss the Reggae massive. For his final song Love And Devotion, Mishka asks us to "please, lovely people, help me sing!" Timidly, some of those present comply, and to their continuing choir, Mishka bids us farewell and leaves stage. As we proceed to our next destination, we catch glimpses of the full moon, and I keep humming the sweet melody of Love And Devotion to myself. What a wonderful prelude to an evening filled with live music! We reach the Fabrik just in time to see The Bebble Rockers take set behind their instruments. Christophe Smith (drums), Craig Higgins (bass & backing vocals), Shane Greensword (keys), Robert Malcolm (percussions), Richard Nelson (guitar), Shackair McQueen (guitar) and backing vocalist Jodian Blake start with an intro of Soul Rebel, when, at 9:30 pm sharp, Kabaka Pyramid joins them on stage, singing Never Gonna Be A Slave. With a simple apparel of black jeans and dark sweater, nothing distracts from his performance. And what a performance this is! More than two years ago, he was showcasing to a backing track selection in a smaller venue called Waagenbau, and even though he'd impressed me already back then by his appearance, his lyrics and his vocal delivery, tonight I'm completely blown away. It's such a joy to see him perform with a full band to back him up! Right from the start he boosts the energy levels with No Capitalist, hailing pioneer Peter Tosh in its wake with a cover of Coming In Hot. While Kabaka pays his tributes to the Foundation, bassie and guitarist take over the spotlight, doing a choreo to "the thing call Drum & Bass!". The band sounds phat, and although they might not have the cool routine of decades of playing as yet, they certainly bring across the vibes. In spirit, Protoje is with us during Warriors, as is Sara Lugo in High And Windy. 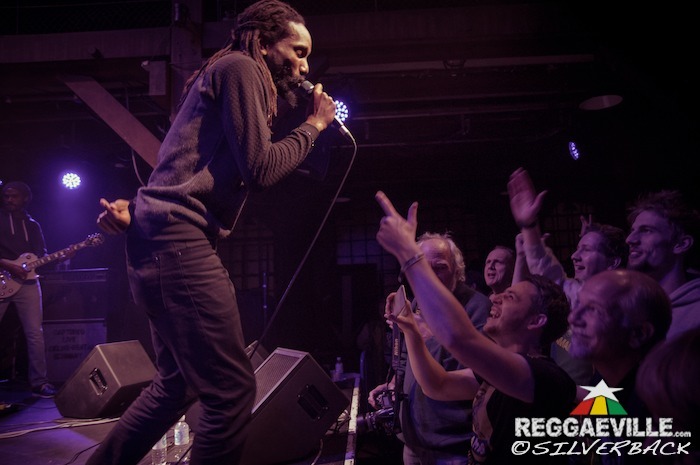 Kabaka makes it very clear that "it's a movement, I don't trod alone", and apart from further cover-snippets of Burro Banton, Capleton, Sizzla and Buju, the singer sends shout-outs to his Revival comrades Chronixx, Jah9, Jesse Royal, Micah and Raging Fyah: "Ina dis ya movement, dem a call it di revival, we all got a part to play. Ina dis ya movement, none a wi no rival, di mission is all the same.". Lyrics! Words that irresistibly drag you into a vision of a brighter tomorrow where brains are used, not boozed, where we share so many similarities that we can embrace and celebrate our differences… Reaching the end of his set, Kabaka Pyramid has obviously managed to reach every single one of the roughly 300 people present, including those who didn't come for or even know him (as one of my friends admitted). My deepest respect to this humble, lyrically intense artist who leaves us breathless after an hour of charismatic performance! 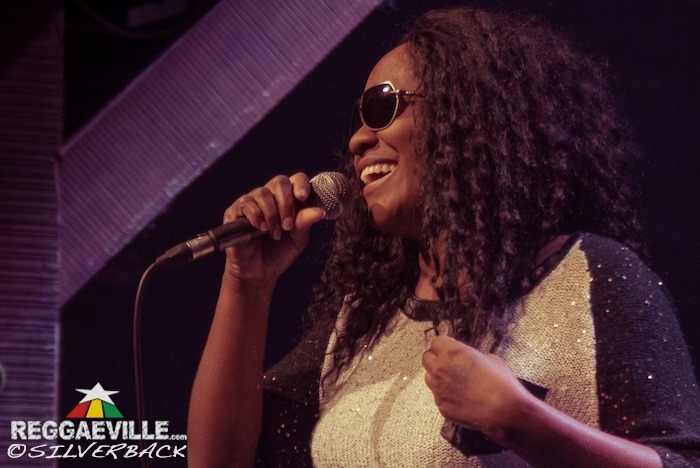 After a short changeover which Selekta Crucial B. fills with sweet Reggae music, one of the few ladies who has managed to make her way to the top of this biz enters stage: Tanya Stephens. It is her first show of the tour, and she is in a talking mood. After going Way Back with hits like You No Ready Fi Dis Yet or Boom Wuk, she sends greetings to Ingo "Pow Pow" who has provided her with the latter's riddim, and also to Silly Walks, who played quite an important part in making her known throughout Germany and beyond. She then continues to share bawdy jokes and stories with the massive, chastising the pertly prompt "Sing!" from Hamburg's notorious troublemaker with the simple statement "You can press play and stop on my CD when you are at home, OK? When you see me live, I take my time to communicate with my people!" The Royal Roots Band from Amsterdam (Jessy on drums, Felitciano and Erno on keys, Derrick on bass) do a good job backing her up, although they don't quite manage to reach the sound and power levels of their predecessors. Tanya's set is a calm one, and as much as Can't Eat Can't Sleep, Spilt Milk or The Truth are beautiful songs tailor-made for her powerful voice, they don't quite manage to give the audience an outlet for the dancing energy still bubbling through the place. Her messages, however, are highly relevant. She speaks of love, the need to see each other as equals (Do You Still Care) and the urgency to end these terrible wars (What A Day): "I feel change is happening, and we all are part of it. It's us who can start to make the difference!" After a loudly cheered It's A Pity, she and the band leave stage, but since she has obviously enjoyed the show so much, Miss Stephens comes back all by herself to continue, singing songs by request of her fans, some of them (like Goggle) challenging her memory of lyrics. As much as Mishka was the perfect beginning, this intimate moment with Tanya was an impeccable completion of a very special night full of different styles, impressions, music… Remember, differences are a good thing and should be cherished and celebrated. Or, as Tanya put it "If we were all the same, none of us would be so awesome!" A heartfelt THANK YOU to Mishka, Kabaka and Tanya as well as the musicians and everyone behind the scenes enabling us to live and feel this awesomeness!